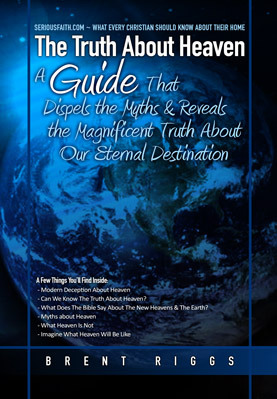 Myth #1: Heaven is “non-earth” – that it is not something we are going to be familiar with. Truth: The Bible says Heaven is a “new Earth” – just as God redeems mankind, he will redeem the Earth and the Heavens as well. Myth #2: Heaven is “other worldly,” and unfamiliar to us, that it will be some source of existence that we have no idea about and cannot fathom with our minds now. Truth: The Bible tells us that Heaven is familiar and earthly; as God redeems the New Heavens and the New Earth – it will be everything that we wish this Earth now could be. Myth #3: In Heaven we will be disembodied spirits, just a kind of ghostly apparition floating around. Truth: In Heaven we are going to be resurrected physically, with new glorified bodies, just like when Jesus was resurrected -- they touched His hands and feet, and they saw Him, and recognized Him, and walked and talked with Him, and ate with Him. We will have resurrected glorified bodies in Heaven. Myth #4: Heaven will be a foreign place to us. Truth: Heaven is everything we know and long for. Heaven will be everything that we wish this world was and that we wish people were, and that neither are right now because of the curse of sin. Myth #5: Heaven means leaving everything behind that you know and love. Truth: Heaven will include all of the good that we experience now, our relationships, the people we love, and the things that we love and know. We will also find even better things that God has prepared for us that we do not even know about yet. Myth #6: Heaven is boring, and static, and tedious. Truth: Heaven is going to be dynamic, adventurous, exciting – there is always going to be something new to learn. No matter how long we have been there, there are always going to be new discoveries and new experiences. Myth #7: There will not be any sun or moon in Heaven; it will just be perpetual brightness with no variation whatsoever, kind of like sitting under a nonstop sunlamp. Truth: The Bible says there will be no need of a sun or moon because God is the original source of light; the sun and moon existed in the original creation (as revealed in the Book of Genesis) and it probably will exist in Heaven as well. We are not told that in the Bible, it is just speculation, but the point is that if we carry forward the Biblical statement that there is no need of a sun or moon to give us light, it is probably a safe speculation to say that there will be variations in light, but that we do not need it to survive. God will be the light and the life that we need to survive. Myth #8: There will not be any bodies of water or oceans. Truth: There will be no more seas (large oceans that are treacherous and that separate mankind and keep them away from each other), but we know already from Scripture that there are rivers and water. These rivers and water have to flow somewhere, so there will probably be lakes or large bodies of scenic water in Heaven -- beautiful lakes and large bodies of fresh water for us to enjoy. There will not, however, be the seas as we know them today, like the Atlantic Sea or the Pacific Sea, because they are treacherous bodies of water that in Scripture often represent sin and death. There will be NO sin or death in Heaven. Myth #9: Heaven will be strange and unknown to us, unfamiliar to our experience. We have touched on this before, and will a couple more times, but each time we will come from a different angle. Truth: Heaven will be familiar like the old earth that we knew, but new without the curse of sin, and with new delights that God is planning for our enjoyment. Myth #10: Heaven will be a 24-hour-a-day boring church service. Truth: Heaven will be full of constant worship of course, that is part of our very existence there: to live in perfect fellowship with God and actually be in His presence. We will also have purposeful fulfilling work, and we will have friends to enjoy. Heaven will never resemble a boring church service. Myth #11: In Heaven, we will not have any desires – instantly, all the desires we have ever had will be fulfilled. Truth: This is not what God created us to be – we have desires, we are made in His image, and in Heaven there will be an eternity of continuous and fulfilled desires; these desires will be all pure, all meaningful, wonderful, without sin, and all glorifying to God. We will still have passions and desires that God will perfectly fulfill throughout all eternity. Truth: In Heaven, we will have everything wonderful and good that can be imagined, and nothing bad that can be imagined. Heaven will be far from boring. Heaven will be full of excitement. Truth: Heaven will represent the satisfaction, fulfillment, and enjoyment of every pure and Godly desire and longing that we have ever had. We will miss out on nothing, except for heartache and loss, if Heaven were to come right now today. I know in our logical finite sinful minds we have this idea that we might miss out on some things, but the fact is that Heaven will be so satisfying and of such perfection and fulfillment in everything that we desire, we will not miss or long for anything if we were to go to Heaven right this minute.